you can be sure that you can use our rope hoist at many different height levels to adapt to different work situations so lifting anything heavy from heights is easy. 1.Housing is made of zinc-plated steel to resist rusting and wear and tear. 2.Heavy-duty block and tackle mechanism minimizes the work you. 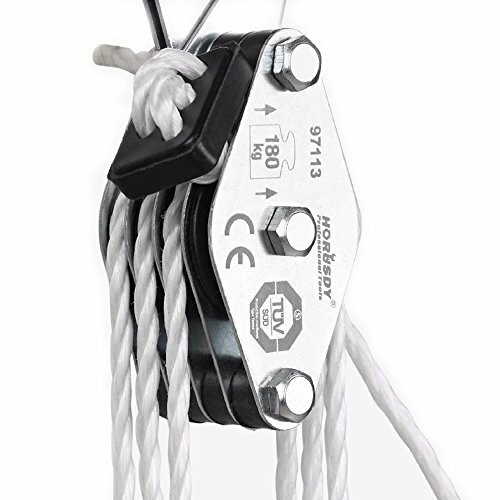 3.Rope length 3m cargo lifting pulley set with a maximum weight capacity of 180kg. 4.Can be used for lifting furniture, row boats, motorcycles, bicycles, supply boxes. 5. Rope is mold and mildew resistant that way everything is absolutely safe to use ensuring that you can lift safely and easily. If you have any questions about this product by SHOWHASH, contact us by completing and submitting the form below. If you are looking for a specif part number, please include it with your message.